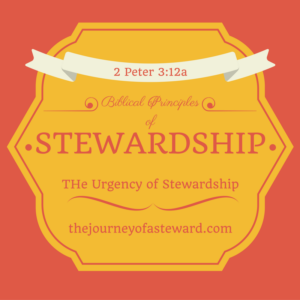 In our series on Biblical Principles of Stewardship, we have defined a steward and discused the responsibilities, disciplines, and hindrances to Biblical Stewardship. If you have missed any of them, I highly recommend going back and catching up as they are foundational to today’s lesson. 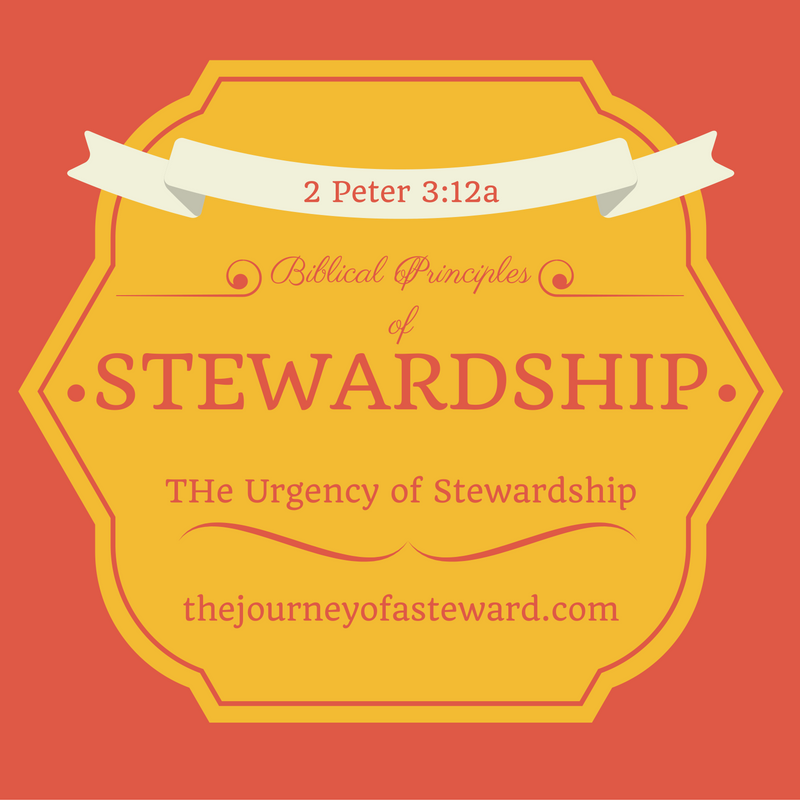 Today, we will talk about The Urgency of Stewardship. Urgency means the condition of being urgent: of pressing importance. the definition for urgent is compelling immediate action: PRESSING. We need to understand and live as if we believe that life is short. The older I get the more I realize the truth of this. It feels like life is in super speed. This life is just a blip in eternity. James 4:14- “Whereas ye know not what shall be on the morrow. For what is your life? It is even a vapour, that appeareth for a little time, and then vanisheth away. We also do not know when the Master will return. If you look around today, we are in a state of definite uneasiness and disarray. On the wake of the election, we could be facing the largest political disaster ever known to the United States and yet we go about as if nothing has changed. Have you ever heard of normalcy bias? Normalcy bias is a mental state that stops people from taking seriously the possibility of a crisis that is outside their normal day to day experience. When people are faced with radical change or a traumatic event they will continue on as if things are “normal”. The opposite of normalcy bias is situational awareness. Situational awareness is being aware of what is happening around you to understand how information, events, and your own actions will impact the world around you, and taking action on this information. In all of this, we have two choices just like the people in the parables we have been studying. The characters in the parables Jesus was teaching to the disciples who were practicing normalcy bias were the evil servant, the unprepared virgins, and the servant given one talent. They just went on, like any other day. How often do we live like this? We say we believe that Christ will return, but we live the same day after day, as if that day will never come? How should we live differently? We need to practice situational awareness. Be watchful! We need to look and observe attentively and carefully. Be alert! We need to be vigilant and never let our guard down. Be prepared! Being prepared is a response of faith. We need to make ready in advance for the return of Christ. Being a prepared servant will look differently for each of us. It’s like packing for a trip. I may pack different items for my family and I than you would. That doesn’t make me any more or less prepared, but the key to prepared packing is to know the purpose and plan for your trip. How do we prepare for the Master’s return? We must know our purpose and the plan God has for us! What has God called you to do? Are you doing it well, preparing for His return? What can you do to practice spiritual situational awareness? Blessings today as you strive for Biblical Stewardship!